In the absence of any countervailing trends, demand for the same breed of dedicated L3 routers that generated $2.1 billion in sales in 2013 would clearly be expected to increase. But there are countervailing trends: In the last year or so, new models have emerged for routing in the backhaul. Software-defined networking (SDN) and network functions virtualization (NFV) are now impacting the industry's thinking about routers – or just routing – in the backhaul. Consistent with NFV, routing can be centrally located and accessed as virtual instances by other backhaul nodes, rather than requiring dedicated routers throughout the backhaul. And SDN controllers have the potential to reduce, or even eliminate, the need for L3 control intelligence in dedicated backhaul devices. The success rate of vendors in the backhaul routing market will be materially impacted by the direction operators take. Incumbent router vendors will inevitably see their market share decline if they fail to take full account of both the threats and opportunities that NFV and SDN present. New-entrant vendors that are prepared to position themselves at the very leading edge of SDN and NFV technology and business cases for backhaul networks have their sights set on capturing operator capex, some or all of which might otherwise be spent on dedicated routers. The Future of Routing in 4G Mobile Backhaul Networks reviews the evolving role of routing and routing products in mobile backhaul networks in the context of these emerging trends in telecom networking. As mobile operators grapple with the need to expand their network capacity and agility to support ever more powerful smartphones and advanced apps, this report forecasts operator demand for routers in the backhaul network through the end of 2017. The report profiles 16 leading mobile backhaul routing vendors, including some key players whose product strategies are disruptive to market demand for routers in the backhaul network. 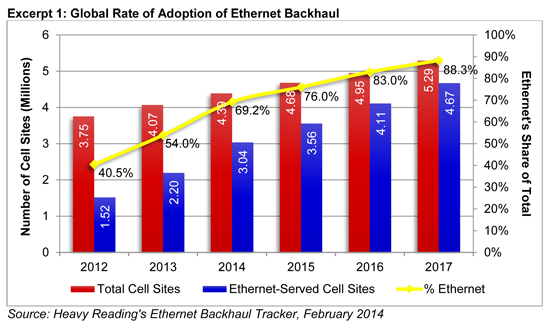 Mobile operators and backhaul wholesale providers began rolling out Ethernet backhaul in earnest in developed markets in the 2007-2008 time frame. As shown in the excerpt below, Heavy Reading estimates that Ethernet backhaul reached more than 50 percent of the world's cell sites at some point during 2013, and is now headed for 69 percent by the end of 2014. Heavy Reading estimates a cumulative total of 2 million routers have been shipped worldwide for deployment in mobile backhaul networks through the end of 2013, as shown in the excerpt below. This includes the smallest form factor cell site routers deployed at the furthest cell site at the edges of the mobile network, as well as the highest-capacity platforms deployed at interim points of concentration in the aggregation, and at the handover to the core. 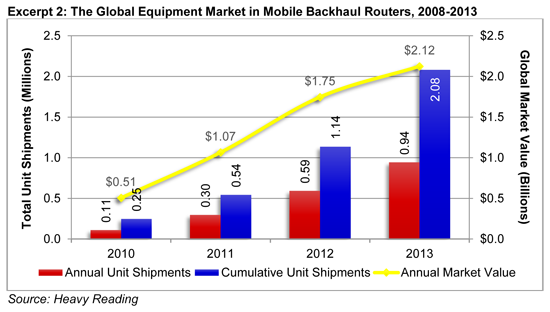 We estimate almost 1 million units of router equipment were shipped into backhaul networks worldwide during 2013. Section II provides the background to how, why and on what scale routers have been deployed in mobile backhaul networks throughout the world – whether at individual cell sites, intermediate points of concentration or aggregation, or at the point of handover between the transport and the core network. It also depicts the competitive environment between the leading vendors in the five years through the end of 2013. Section III depicts key ongoing and upcoming trends in networking requirements and capabilities, both in regard to the direction of 3G and 4G network evolution such as LTE-A, as well as to broader trends in telecom networking such as SDN and NFV. These trends are assessed as the background to analyzing what impact – if any – these new networking trends are likely to have on operator demand for routers in the backhaul network going forward. Section IV provides guidance to router vendors with respect to how they will need to position themselves for success in shipping product for deployment in backhaul networks over the next three years in the context of new requirements emanating from the LTE-A standards, as well as from trends toward SDN and NFV. Section V provides Heavy Reading's global forecast for operator demand for routers in the backhaul network through the end of 2017. It provides the forecast in terms of global unit volumes, as well as global market revenue. It provides contextual analysis of the likely interplay between the drivers of, and barriers to, operator demand for backhaul routers discussed in Sections III and IV. Section VI profiles the leading vendors in this space, as well as some key players whose product strategies are disruptive to market demand for routers in the backhaul network. The Future of Routing in 4G Mobile Backhaul Networks is published in PDF format.